Fresh apricots can be a delightful treat in the summertime. Dried apricots are perfectly fine to eat as well (try to find ones without sulfur preservatives). 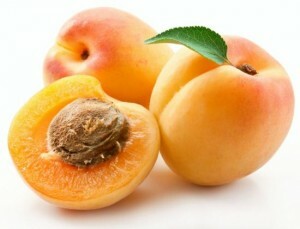 Apricots, often referred to as “stone-fruit” due to having a pit, are a wonderful fruit to add into your diet. Apricots rank very high in antioxidant capacity. They are also one fruit that contains lignins – thought to be an anticarcinogenic compound. The carotenoids in apricots may be another reason why they help protect against cancer. Men eating more whole foods rich in carotenoids, such as beta-carotene (though not beta carotene supplements), have been shown to have less risk of lung cancer. Eating fruit has also been found to be associated with a reduced risk of cancers of the mouth, throat, and digestive tract. Eating whole fruits, in general, tends to promote health and wellness. Men consuming just 2-3 cups of fruit per day may have less risk of heart disease, type 2 diabetes, and hypertension. Snack on dried apricots or other dried fruit. Add fresh apricots to overnight oats or toss onto salads. Enjoy fresh or dried apricots in the morning with granola, plant-based milk, and dairy-free, unsweetened yogurt (e.g. organic soy or coconut based yogurt). Carlsen MH, Halvorsen BL, Holte K, et al. The total antioxidant content of more than 3100 foods, beverages, spices, herbs and supplements used worldwide. Nutr J. 2010 Jan 22;9:3. Akcicek E, Otles S, Esiyok D. Cancer and its prevention by some horticultural and field crops in Turkey. Asian Pac J Cancer Prev. 2005;6(2):224-30. Riboli E, Norat T. Epidemiologic evidence of the protective effect of fruit and vegetables on cancer risk. Am J Clin Nutr. 2003;78(3 Suppl):559S-569S. Tavani A, La Vecchia C. Fruit and vegetable consumption and cancer risk in a Mediterranean population. Am J Clin Nutr. 1995;61(6 Suppl):1374S-1377S.